Dynamic sets a new standard of protection against tears and grazes and successfully combines previously unimagined levels of protection with incredible lightness and extreme comfort. Dynamic leaves you free to pursue your prey anywhere, even amongst the thorniest brambles. B-Tex, The Revolutionary Fabric Setting a New Standard of protection against thorns. During the tireless search for new technologies and solutions conducted at our Clothing & Accessories Development Centre, we have identified an exceptional fiber known as Dyneema®; 15 times stronger than steel but softer, incredibly light and long lasting. In conjunction with DSM, which has patented and produces Dyneema®, and Italian companies with extensive experience in weaving, Beretta has succeeded in ‘inventing’ the first fabric made from Dyneema®. Months of experimentation, tests and controls in the laboratory have led to the creation of B-TEX which combines, both in warp and weft, six picks of High Tenacity Polyamides and one pick of Dyneema®-based yarn, with a special ripstop construction that creates this sort of ‘grid’ of a paler colour which can even be recognized on the finished fabric. This is an exclusive invention by Beretta, made entirely in Italy. B-Tex weighs only 167 g/sq. 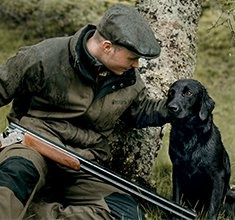 m. and provides incredible levels of resistance against cuts, tears, warp, wear and pilling, compared to the toughest fabrics previously available for hunters’ clothing. We have invented a new machine for laboratory testing resistance against thorns. It consists of a pendulum loaded with a weight of 1250 g, at whose edge a steel point is attached. The steel point is released from a fixed distance onto the fabric, firmly attached to a loom at the base of the lever. The results of the impact on the fabric are monitored visually on a backlit screen. The garments in the Dynamic line are created using Gore-Tex® Z-Liner technology in three layers. The outer layer uses B-tex as its main fabric. In the areas most exposed to wear, a second fabric is added made of aramid fiber mixed with high tenacity polyamide to enhance its resilience. Both are treated with a Teflon® wash to render them both waterproof and stain-resistant. The central layer consists of a Gore-Tex® membrane which is completely waterproof, windproof and breathable. The third inner layer consists of lining made of Coolmax®, with the iconic Beretta checked pattern. Thanks to its special sixsided section, Coolmax® yarn helps to keep a balanced body temperature and lets excess perspiration pass through.